Grass with water droplet and rainbow in morning sun. Alaska. Galapagos Sea Lion (Zalophus wollebaeki) pup. Galapagos Islands. Black-crowned night heron (Nycticorax nycticorax). Hawaii. Galapagos land Iguana (Conolophus subcristatus). Galapagos Islands. Sally lightfoot crabs (Grapsus Grapsus) on rocks in the Galapagos Islands. Blue-Footed booby (Sula Neboxuii) "dancing". Galapagos Islands. Silhouette of a Galapagos penguin (Spheniscus mendiculus). Galapagos Islands. Purple lotus (Nelumbo nucifera) in my garden. Bahamas. Galapagos sea lions (Zalophus wollebaeki) on an Easpanola Island beach. Galapagos Islands. A curious young black bear (Ursus americanus) near Kenai Fjords Glacier Lodge, Alaska. A pig wading in the ocean about to devour some apple. Bahamas. A brown pelican (Pelecanus occidentalis) flying over water in the late afternoon. Socorro. Girl feeding pig from a boat in the Exumas, Bahamas. Grass with water droplets lights up in the morning sun. Alaska. A brown pelican (Pelecanus occidentalis) bites my dome port. Galapagos Islands. Great Frigatebird (Fregata minor) chick. Galapagos Islands. View of Raja Ampat, Indonesia. Masked Booby (Sula Dactylatra) chick. Galapagos Islands. Coquí frog on the Big Island. Coquí frogs are named for their high-pitched nighttime mating calls (which have caused Big Island residents many sleepless nights). The Coquí frog is native to Puerto Rico. Hawaii. Great Frigatebird (Fregata minor). Galapagos Islands. Galapagos penguin (Spheniscus mendiculus) races by underwater. Galapagos Islands. Galapagos giant tortoise (Geochelone nigra). Galapagos Islands. 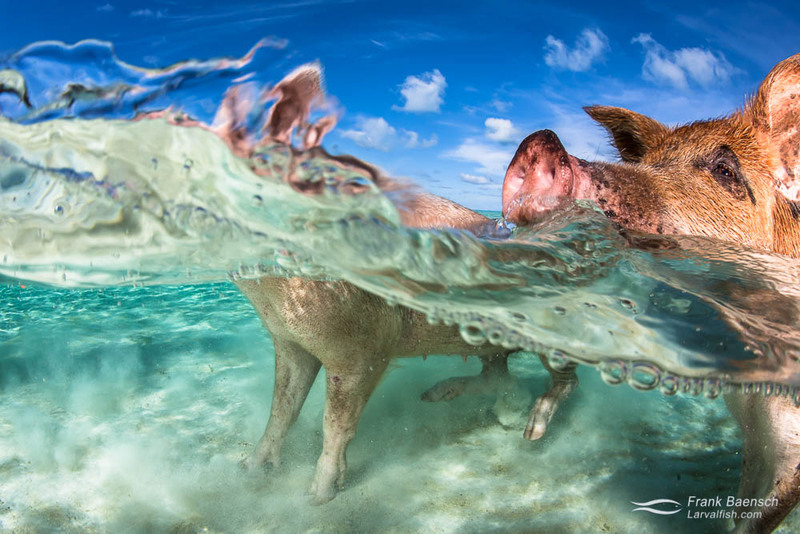 Pigs wade out from a beach in the Bahamas. Piglet suckles sow on a beach in the Exumas, Bahamas. A swimming pig in the Bahamas. Two masked boobies (Sula Dactylatra) resting on rocks by the sea. Galapagos Islands. Baby gold -dust day gecko (Phelsuma laticauda) on a plumeria flower. Hawaii. A pig swims out from a beach in the Bahamas. A pig wading in the ocean sniffs my camera. Bahamas. Blue-Footed booby (Sula Neboxuii). Galapagos Islands. Baby gold -dust day gecko(Phelsuma laticauda) on a plumeria flower. Hawaii. Gold-dust day Gecko (Phelsuma laticauda) baby on a palm leaf. Hawaii. Dead tree on a sand bar in Eleuthera, Bahamas. Girl feeds swimming pig in the Exumas, Bahamas. A flock of Laughing gulls (Leucophaeus atricilla) crearing a ruckus. Bahamas. Great Frigatebird (Fregata minor) chick. Frigatebirds are light, weighing between 1–1.8 kg (2.2–4 lb), and have the highest ratio of wing area to body mass, and the lowest wing loading of any bird. This has been hypothesized to enable the birds to utilize marine thermals created by small differences between tropical air and water temperatures. Juveniles are black with a rust-tinged white face, head and throat. Galapagos Islands. Great Frigatebird (Fregata minor) juvenile. Frigatebird adults are light, weighing between 1–1.8 kg (2.2–4 lb), and have the highest ratio of wing area to body mass, and the lowest wing loading of any bird. This has been hypothesized to enable the birds to utilize marine thermals created by small differences between tropical air and water temperatures. Galapagos Islands. American oystercatchers (Haematopus palliatus). Galapagos Islands. Komodo dragons (Varanus komodoensis) in Komodo National Park. Indonesia. Bird's eye view from topmast. Valentines Marina, Harbor Island, Eleuthera. Bahamas. Masked Booby (Sula Dactylatra) with chick. Galapagos Islands. Gold-dust day Gecko (Phelsuma laticauda) on a bromeliad leaf. Hawaii. Pigs wading in the ocean in the Exumas, Bahamas. Komodo dragon meets GoPro. Indonesia. Praying mantis (Manodea sp.) in my garden. Hawaii. A pig wades out from the beach in the Bahamas. Flightless cormorant (Phalacrocorax harrisi). Galapagos Islands. Pigs swimming in the Exumas.